This year Nutella is celebrating its 50th anniversary. I tried finding out when the actual date is, but the interwebs failed me. Ok, I’ll admit, I didn’t dig that deeply. My plan is to celebrate Nutella every day. Which is something I do regardless of whether or not the creamy, chocolate, hazelnut spread is celebrating a golden anniversary. I have loved Nutella since I was a young child. My mom introduced me to the chocolate hazelnut spread in the ’80s, before it was widely distributed in the US. 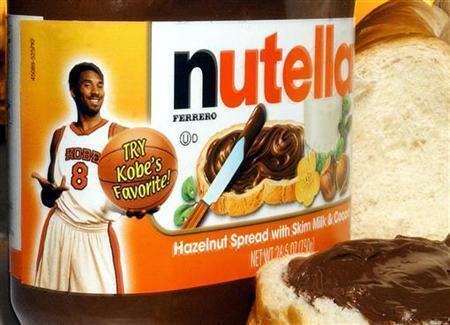 This was when Nutella was in a glass jar, and you’d never see a picture of Kobe Bryant on the label. This was back when it was imported from Italy. Every Christmas my mom (Santa) would stash a jar of Nutella in my stocking. The tradition still lives on, although now I receive a wrapped jar rather than from Santa. My mom, who has created and fed into my love for Nutella, brought back a 3 kg (105 ounce) jar from Italy in 2000. The jar, untouched in its expired, most likely rancid glory, serves as the best conversation piece I’ve ever owned. Almost everyone who comes to my house is drawn to the jar’s size. It’s amazing how many people have great Nutella experiences, and my gigantor showpiece inspires people to share their stories. My favorite way to consume Nutella is with a spoon, mainlined straight from the jar. However, I try not to do that too often. 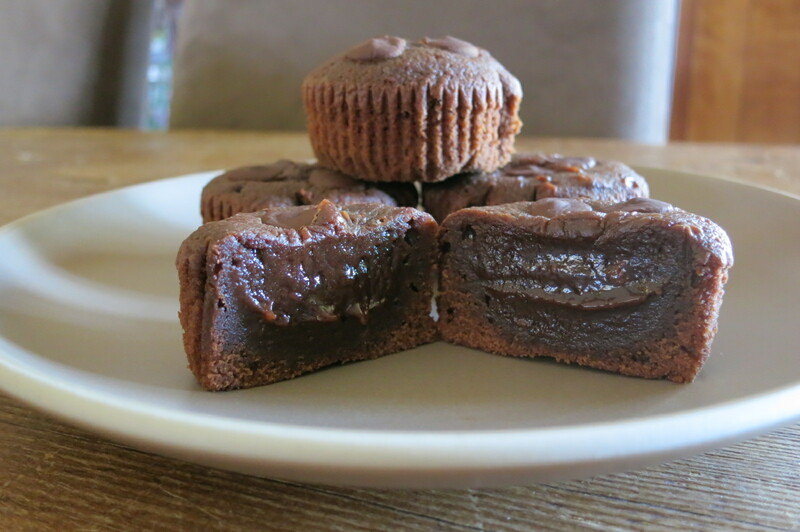 My second favorite way is to make Nutella-based sweets with minimal ingredients. You see, Nutella needs to shine on its own without a bunch of other elements taking away from the star attraction. This four-ingredient brownie is simple and the flavor of Nutella really comes through. If I can’t eat it from the jar, this brownie is the next best thing. You may need to heat the Nutella in the jar to soften it a bit to make it easier to work with. I find that topping the brownies with chocolate chips takes away from that true Nutella flavor. Try half with chocolate chips on top and half without. 1. Preheat oven to 350 degrees. Line a muffin tin with paper liners. 2. Mix together eggs and Nutella in a medium bowl until smooth. Add flour and salt and mix until just combined. 3. Evenly spread Nutella mixture into prepared muffin cups, about half of the way to the top. Sprinkle each with three chocolate chips, if desired. 4. Bake 13 minutes. The brownies will be gooey on the inside. 5. Remove from muffin tin once cooled, about 15 minutes. Makes about 8 brownies. Previous Postlearning chinese cooking from the best: ti pongNext Postdid someone say summer? One of my favorite ways to consume Nutella, besides “main lining”, is to mix it with peanut butter or almond butter, or both. Spread it liberally on your favorite bread choice for toast and voila, a very easy and yummy breakfast. Of course you don’t have to limit yourself to one piece of toast. We have a rule in our house that Nutella is only to be consumed on the weekend. Otherwise Lewis would be having pancake nutella sandwiches every day of the week. I’ve honestly had to hide the nutella from our 4-year-old. Love this – can’t wait to try it.